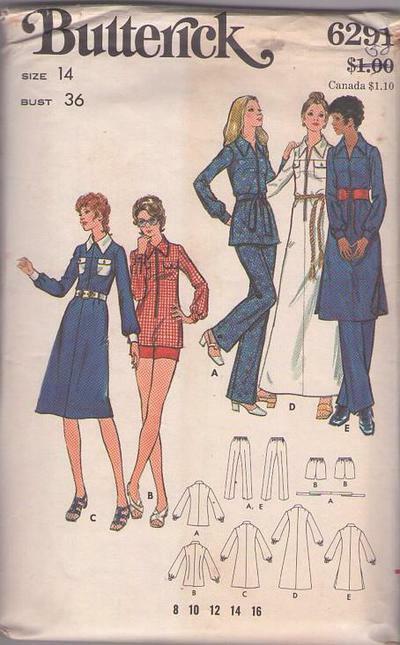 70s Separates, Retro Casual Clothing Patterns - Dress, tunic & pants. Semi-fitted A-line shirt dress, 3” below knee or ankle length and tunic top has front zipper closing, self or contrast shirt collar and full length sleeves gathered into self or contrast bias buttoned cuffs. With or without side slit and self or contrast patch pockets with flaps & button trim. Straight legged pants or shorts have elasticized waistline. Self tie or purchased belt. Cool!